I tried to attach a picture but unfortunatly I am to describe it in words only. 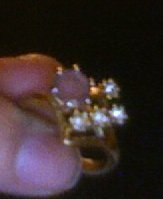 I don't know if it's costume jewelry, faux vintage or anything else... the ring is soft, smooth gold 3/4 down from the top the texture and color change to a dull gold the inside on the bottom is rough and ridged stamp similar to this. there are four tiny (diamond/glass/cz) forming a triangle a 1/4" round (rose quartz? amethyst alexandrite?) smokey flat top with beveled/faceted around and below. Each stone is raised away from the band and individually mounted. I can't tell if these are glued or of they are held in with prongs only. I'll try the photo again. I hope that my description will be enough to go on, this has been challeging and frustrating me for days.